The late astronaut Neil Armstrong, first man on the moon, will be memorialized in ceremonies around the country on Friday (Aug. 31). Armstrong, 82, passed away Aug. 25 due to complications resulting from cardiovascular surgery, which he underwent earlier this month. In July 1969, Armstrong commanded Apollo 11, the first manned lunar landing mission. His first words upon setting foot on the moon were, "That's one small step for (a) man, one giant leap for mankind." Armstrong's family, together with invited guests including the first moonwalker's fellow astronauts and the leadership of NASA, were gathering for a private memorial service in Cincinnati. The ceremony at the Camargo Club, a private golf course, was scheduled to begin at 11 a.m. EDT (1500 GMT). According to NASA, planning is underway for a national service to be held Sept. 12 in Washington, D.C., although no other details have been released. In the meantime, two NASA centers were holding public tributes on Friday. The U.S. Space & Rocket Center, the visitor center for NASA's Marshall Space Flight Center in Huntsville, Ala., announced a 10 a.m. EDT (1400 GMT) ceremony around its vertical Saturn V rocket display, where red, white and blue balloons would be released in memory of Armstrong. The Kennedy Space Center in Florida was also set to meet around its moon rocket exhibit at the Apollo/Saturn V Center, where center director Robert Cabana was set to lead the remembrance. President Barack Obama ordered flags be flown at half mast on the day Armstrong was interred, although when that will occur and where the late moonwalker will be laid to rest is not yet public. Earlier this week, the Armstrong Air and Space Museum in the astronaut's hometown of Wapakoneta, Ohio held a public tribute, where attendees gathered to "wink at the moon," a gesture first suggested by Armstrong's family. "For those who may ask what they can do to honor Neil, we have a simple request. Honor his example of service, accomplishment and modesty, and the next time you walk outside on a clear night and see the moon smiling down at you, think of Neil Armstrong and give him a wink," the family said in a statement. In a coincidental bit of cosmic alignment, Friday is a "blue moon," or the second full moon of the month. More tangible tributes are underway on television and in print. The Discovery Channel is set to air "One Giant Leap: A Neil Armstrong Tribute," a new one-hour documentary, on Saturday at 8 p.m. EDT (check local listings). The program includes footage from Armstrong's final public appearance and interviews with Apollo 11 crewmates Buzz Aldrin and Mike Collins. And Easton Press, which specializes in limited edition, leather-bound books, has partnered with LIFE magazine to publish a special 96 page photo retrospective. The book, "Neil Armstrong, 1930-2012," is set for release in October. Armstrong's family has established the "Neil Armstrong New Frontiers Initiative," a memorial fund benefiting the Cincinnati Children's Hospital Medical Center. They have asked that in lieu of flowers, memorials be made to the Initiative or to two scholarship funds setup in Armstrong's name by the Telluride Foundation and by the American Institute of Aeronautics and Astronautics (AIAA). 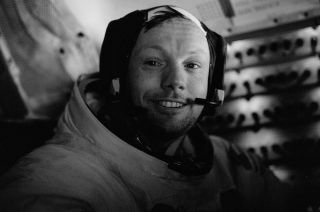 For more information about the Neil Armstrong scholarship and memorial funds, see neilarmstronginfo.com.